Ooh, why do I always feel I have to understand things immediately? Not just select items, but everything, and perfectly to boot. Since discovering Twitter I’ve come across so many new techy things, and have dived (dove?) right in to try to discover how it all works. Twitter came first, then blogs, which necessitated getting to grips with RSS feeds (as well as starting this, my own blog, of course). For news and other feeds I started off on NewsFire, but the disadvantage of that is of course that it’s a standalone application and so is only on my laptop. Enter NetVibes: salvation! All my bits and pieces in one place so I can even skive at work! But, ah – there’s another element to it, and that is the option to share online. Share? What’s that all about then? I’ve shared photos on Flickr and other sites, but that’s about as far as it’s got so far, other than FaceBook and a messageboard. But this seems different. Share what exactly? Then I realise there’s a whole world of internet sharing out there. Not just blogging, no, that’s in the ha’penny place really: a blog is just not enough. It seems that to share properly we have to have del.icio.us, Digg, Reddit, Stumble, LastFM, Pipes, Muxtape, Remember The Milk, Scribd, Zemanta (which I forgot to use for this), ClipMarks, OpenID… and these are only the ones I can remember without looking up. 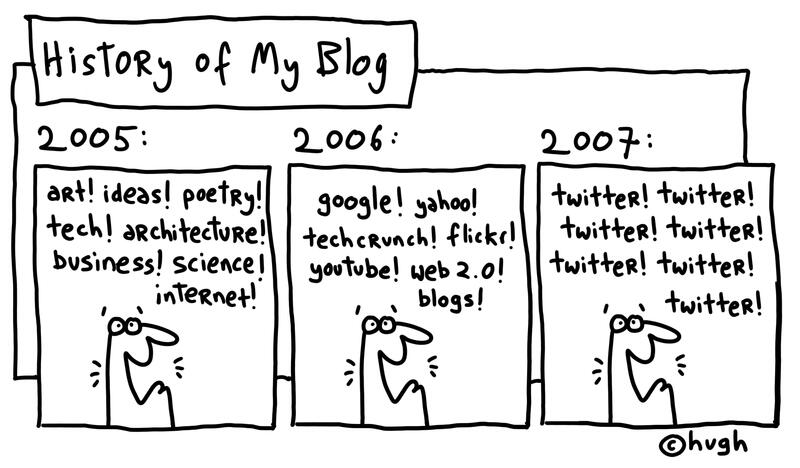 Is this what is meant by Web 2.0? And what exactly are we sharing? Other websites, interesting bits and pieces… anything original? I don’t know yet. I realise this is just scratching the surface and the serious techy stuff is probably a whole new level, but for now this part is absorbing me, and holding my interest. And as for OpenID… do I really want it? Do I want everything all linked up and my whole life (such as it is) available to all? I saw this interview (from one of my RSS’d blogs) just after I had written my first blog and linked it to my Flickr, Twitter and MySpace accounts. Then I realised that I too have different identities in different places, so I hastily unlinked my MySpace account. I’m still not sure how much of me I want online, and so a degree of separation suits me fine, for now. But what a learning curve there seems to be. I’m following in Twitter, and RSSing, a few techy blogs as well as some creative types, and there seems to be so much going on that’s really interesting, I want a slice of it. But like a kid in a sweetshop, I really have no idea what to choose and what to leave behind, and I seem to be sampling it all in soundbites rather than sitting down properly to absorb fully what it’s all about. But with Twitter links coming at me right, left and centre, and all these interesting blogs to read, how can I filter what’s useful and what ain’t, and have a normal life too? I don’t yet know, but finding out is half the fun.